​It has been a good week with many tender mercies and miracles on the street contacts and tracting. We found 2 new investigators through tracting. We really worked hard this movecall trying to talk with everyone on the street. Yes, Sister Bell is great, I learned a lot from her about being calm and hopeful. 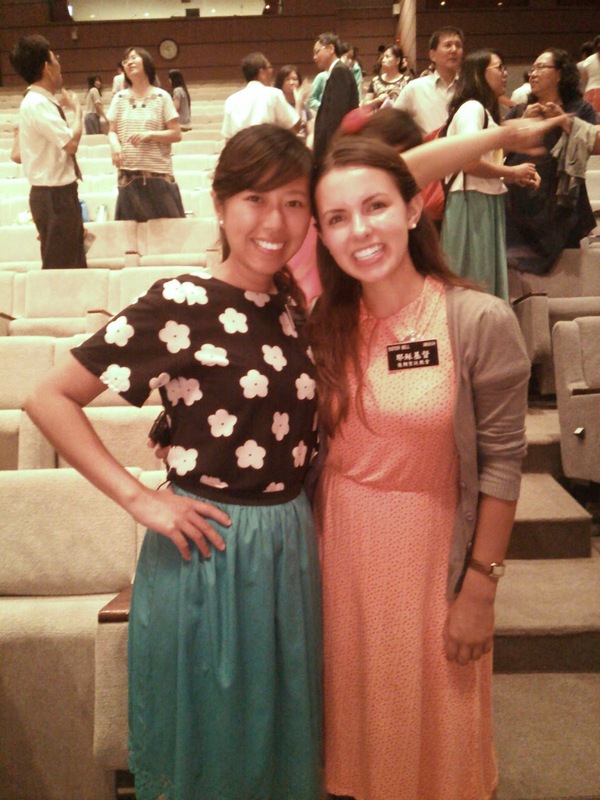 She is a wonderful missionary. I love Tainan too. It is a great place that has good people everywhere who desire of the truth. Many people here are already Christian due to the Christian history in the area which make it easier to relate to people on the street. The food are very cheap too compared to the north. One of the highlights of the week was going to see a Kuha'o's musical concert with our investigators. It was such a blessing to be able to go see how talented he was. If any of you hasn't heard of him yet, go to our church website or youtube to check him out. He is a blind 18 years old young man from Hawaii and he can play beautiful piano music. At the concert, he listened to this Taiwanese song that he only heard for the first time in the concert and can play the music straightaway. His grandma shared with us that when Kuha'o was borned, he wasn't expected to live. Yet, through the grace of God and the talented skills of the doctors, he survived. He didn't let his blindness stop him from developing his gift and talents from God. Most importantly,his blindness is a blessing because he just love everyone (since he couldn't see the different of people behaviours or colours.) His example taught us that no matter how difficult life seems to be, our attitude will determine the outcomes. I really like what I've learned this week in Ether 10:10-11--> Though Morianton being the king of the land trying to ease the burden of the people and do justice to them, of all the goodness he has done, because his many whoredoms, he still cut off from the Lord. Though goodness of the society and other religions can help people to be better yet these goodness changes due to the trend of the society and wisdom of men, they could not bring us salvation unless we do what the Lord wants us to do like the commandments he gave us. Commandments are the goodness from God that will lead us to salvation and exaltation and they never change according to the favor of men. I understand and valued even more the important of restored gospel and words of prophets in our days. Wish you all have an awesome week~~!! !